The federal government faces veteran status two ways: (1) personnel management and (2) leadership from the president and top appointed officials. Since our founding, we have chosen generals who have fought to defend our country such as George Washington, Andrew Jackson and Dwight Eisenhower. As wars have faded into the past, we have elected those who served at junior levels like McKinley, Truman, Kennedy, Nixon, Carter and George H.W. Bush. Until 1992, being a veteran was an unofficial requirement to run for the office. This reflects an atavistic belief that one must defend his country in order to earn the right to lead it. Up through World War II, African-Americans were limited in combat and this was used to justify segregation. The Civil Rights Movement brought attention to incidents of postwar violence against Black veterans. The Tuskegee airmen were glorified as a happy exception. Nisei combat units, recruited from Hawaii and California, proved the loyalty of Japanese-Americans. Throughout much of the 20th century, ambitious young men who aspired to politics like Jack Kennedy and Daniel Inouye volunteered for dangerous assignments. It was the good war won by the greatest generation. In his inaugural address, Kennedy spoke of a new generation “tempered by war.” Veterans were seen as a superior class. Sociologists found them above average in literacy, intelligence and health. They were disciplined and serious. Furthermore, the numbers of veterans were great: 16 million out of a population of 140 million. Both factors led to esteeming veterans. The picture changed for Vietnam. This was not a good war. By 1970, it seemed to be a cynical adventure in an unimportant country. Military service was not noble. Soldiers were not heroes defending America, but victims. They continued to be higher on sociological characteristics. Their numbers were high, but lower than World War II: 9 million out of a population of 200 million. Vietnam veterans acquired the reputation of lost souls. A few were violent, giving us the term “going postal.” As they aged, the image became an old guy on a Harley Davidson. Being a veteran was no longer a prerequisite for a political career. The present situation is much different from after World War II. We have had an all-volunteer Army since 1973. The numbers in the military are much lower: 1 million out of a population of 325 million. The image of the veteran is not so positive. As Wounded Warriors, they are painted as brain damaged, amputated and homeless. News stories after the killing of five police officers in Dallas two weeks ago were quick to note that the assassin was a veteran of Afghanistan. And after the killing of three more police in Baton Rouge last week, the news noted that the assassin was a veteran of Iraq. Today, being a veteran is not a requirement for a political career. From the perspective of public administration, the other aspect of veterans is their preference for hiring in government jobs. The ordinary level of 5 points has the purpose of a reward for putting ones-self at risk and as a reward for interrupting a career. The 10-point preference is to reward those disabled in combat. The system is not fully responsive to the goals. For instance, earning a Purple Heart gives 10 points even though the wound may have completely healed with no disability. Congress, in its desire to please, has been overly generous in giving medical status to conditions with little scientific proof such as Agent Orange. The veterans preference has other problems. Its rules are arcane. Its use can be manipulated. It discriminates against women, who in the past rarely served. 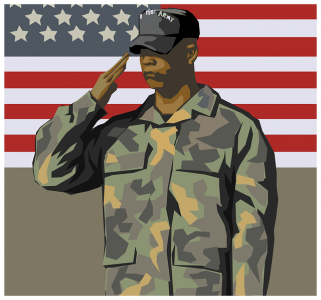 Many state governments give preference to veterans. New Jersey gives extra points for hiring, but also for promotions. Hence a veteran gets an edge throughout his entire career. Veterans preferences have a long history. The United States gave them for the War of Independence, the War of 1812 and so on. For the Civil War, it (understandably) did not reward Confederate veterans, a factor that disadvantaged the South in recovering. Indeed, the Roman Empire helped its veterans by encouraging them upon retirement to settle where they served on the frontier making them colonies. Author: Davis is a veteran who served as artillery forward observer in the 1st Infantry Division in Vietnam. He teaches public administration at the University of Toledo. Email him at [email protected].